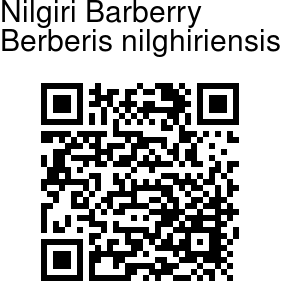 Nilgiri Barberry is a critically endangered shrub, about 2-2.5 m tall. It was believed to be extinct, but was rediscovered after about 140 years, in 2012. The stem is hairless, with vertical lines; internodes 1-3 cm long; spines 2-3-4-partite, central longer than laterals. Leaves are 4-7 at each node, 1.5-5 x 0.7-1.8 cm, oblong-obovate, stalked, base wedge-shaped, margins entire, sometimes slightly wavy, veins netveined, tip mucronate, grey powdery below. Prophylls 4 × 3 mm, red, ovate, blunt. Flowers are borne in 6-15 flowered racemes, 2.5-8 cm long, including flower-cluster-stalk. 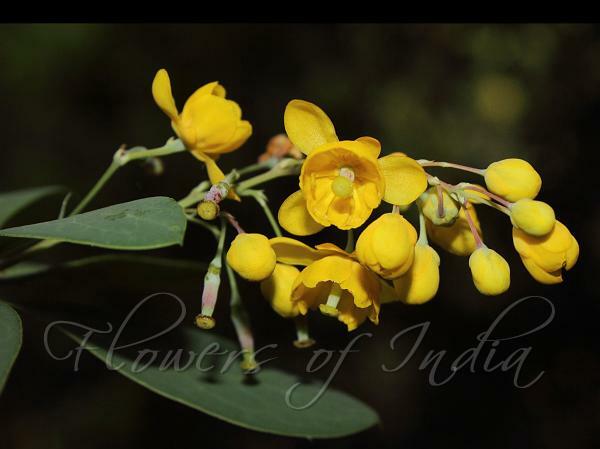 Flowers are yellow, 4-6 mm in across; flower-stalks 4-9 mm long. Outer sepals 3, 4.2-5 x 2.5-3 mm, elliptic, inner sepals 3, 6-6.5 x 3.8-4.2 mm, obovate. Petals are 6, 7 x 4 mm, obovate, notched with rounded lobes, base clawed with linear lanceshaped glands. Stamens are 6, about 4 mm long, anti-petalous. Berries are 6-9 x 2-2.5 mm, ellipsoid-oblong, greenish-purple when young, turning powdery blue or pinkish when mature. Nilgiri Barberry is endemic to Nilgiris, Tamil Nadu. Flowering: February-April. Identification credit: S. Jeevith, V.S. Ramachandran Photographed in the Nilgiris, Tamil Nadu.